This set of Foundry online quiz focuses on “Types of Risers”. 1. _________ is exposed to atmosphere in open riser. Explanation: The open riser is the one in which the full riser indicates that the mould cavity has already been completely filled up with the same. It happens because the top end is exposed to the atmosphere. 2. ______________ is the only feeder force in the open riser. Explanation: The liquid metal in the open riser is fed to the solidifying casting under the force of gravity and the atmospheric pressure till the top surface of the riser solidifies and thereafter it is observed that the gravity is only feeder force. Explanation: In a open riser, the top of the riser was exposed to the atmosphere. An open riser is connected either at the top of the cope or on the side at the parting line. Hence, the shape of the open riser is cylindrical to facilitate these connections. 4. An open riser is easy to mould as compared to a blind riser. Explanation: An open riser is open to atmosphere, thus it ensures that unlike a blind riser it will not draw metal from the casting as a result of partial vacuum in the riser. Hence, it is easier to mould compared to a blind riser. 5. An open riser is difficult to remove compared to a blind riser. Explanation: A blind riser is smaller in size than an open riser. They can be placed at any position but the open riser cannot be placed in the drag. It is generally larger than the blind riser. Hence, it is difficult to remove. Explanation: A blind riser is a rounded cavity and it represents the minimum practical ratio of the surface area to the volume and thus associates a slow cooling rate. It is more efficient to use a round shaped blind riser. Explanation: The blind riser is surrounded by sand from all the sides in order to be used in the casting. Due to the presence of this sand the metal in the riser cools slowly. The cooling also depends on the type of metal used. 8. A blind riser can be placed only in specific positions. Explanation: The size of the blind riser is smaller than that of the open riser. It is possible to vary the shape as well and hence they can be placed at any position in the mould. 9. Blind risers promote directional solidification better than the open risering. Explanation: The height of the riser is determined not by the feeding requirements but by the depth of the molding box used. In the case of blind riser these aspects could be varied so it has better solidification than open risering. A blind riser will draw directional solidification from liquid metal from the solidifying casting. 10. The blind risers are connected at top of the cope. Explanation: The blind risers are usually round in shape. It has a minimum practical ratio and hence they are either connected at the top of the cope or on the side of the casting at the parting line or in the drag. 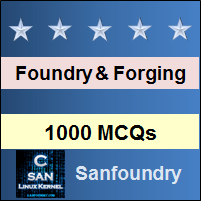 To practice all areas of Foundry for online Quizzes, here is complete set of 1000+ Multiple Choice Questions and Answers.